Is this video proof that Andy died? In researching Andy Kaufman, I found this video, of an exhumation, which supposedly proves that Andy is dead. The trouble is, the source is unreliable. We have no idea whether it’s genuine or fake. The corpse appears to be a real deceased body, but is it really Kaufman? I could find little information about it. To fully understand this, you must know something of Kaufman himself, so here’s his story. Twenty years ago, on May 16, 1984, the world lost a comedic legend. 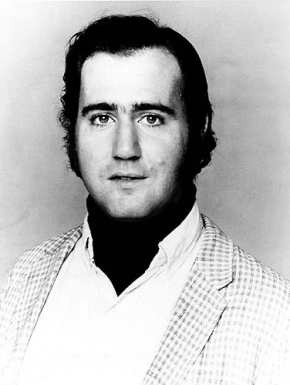 His name was Andy Kaufman, and he’d succumbed to a rare form of lung cancer at the age of thirty-five. Some fans, however, believed that Andy, who had a unique personality and performance, to say the least, didn’t die, but faked his own death. Such fans vow that Andy will eventually make a comeback. After all, he’d stated many times that he intended to do so. And since he loved to play pranks on his friends and fans, his posthumous reputation has grown like a cult that venerates him as something of a comedic god. One of the central tenets of this cult is that Andy is alive and well at age 55, possibly in New Mexico, possibly a monk. Some theories claim he lives in New York City on the upper west side. Another claims he’s in Europe waiting tables. 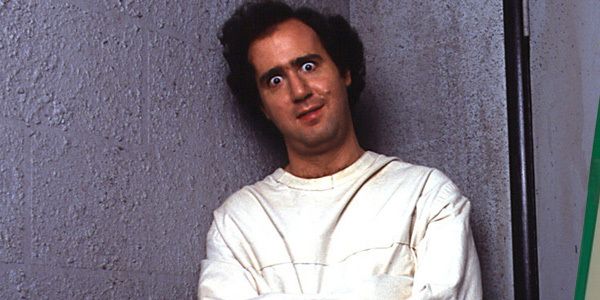 In fact, many photos have circulated the net purported to be none other than the aged Andy Kaufman, but no one has supplied any proof that he still draws breath. Whether any of these stories are supported by facts is immaterial. The speculation itself is another tenet of the Kaufman cult as a key to his stage act was always to inhabit a character whose real life was indistinguishable from fiction. Speculation and anticipation grew among Andy’s fans last April when Saturday Night Live celebrated its fortieth-anniversary. Fans were sure that Andy would make an appearance during the live special. However, Kaufman remained a no-show. This wasn’t the first time that Kaufmanheads have been disappointed. Yet, undaunted, they remain convinced that, at any moment, Andy will stumble into a Hollywood Studio, reciting the entire text of “The Great Gatsby,” or, perhaps, reenacting his infamous “Mighty Mouse” routine, or perhaps, reclaiming his Elvis persona. Elvis, who has often been spotted postmortem, would certainly be appropriate. If Andy returns, however, any act he performs will send a rush of sheer delight and relief through his adoring audience. After his death, some of Kaufman’s closest friends and family members were even convinced that his demise was just another prank and claimed that Kaufman often spoke about faking his own death. Zmuda isn’t the only insider who continues to talk like this. Kaufman’s brother, Michael Kaufman, publicly stated that he’d received a letter from Andy in 1999, but he later recanted the statement. Some of the fans wholly believe that, yes, Kaufman’s death act is going on a bit long. But, you see, it must. It wouldn’t be a death act if it didn’t. The longer it goes, the more Andy Kaufman waits for his cue, and the deeper the joy and satisfaction when he returns. Many remain convinced that Andy’s supposed death is merely the greatest comic prank ever conceived and executed. 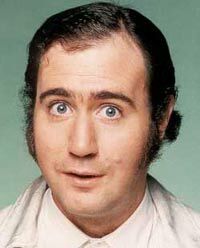 Andy Kaufman, by all accounts, is alive and well, somewhere out there. And any day now, he’ll make an appearance and offer up a shy curtsy, and say “tank you veddy much.” The awe-inspired crowd would jump for joy. But, in his long and ever-growing absence, it is his fans’ turn to sustain, in Andy fashion, the perfect performance of fiction verses fact. And, perhaps, even knowing that it may never come, we all just want a happy ending in the grim face of death. With certainty, we can say that though his body may have departed, his soul is still alive on earth and growing ever strong. So perhaps we can conclude that Andy, whether he’s physically alive or dead, lives on, is immortal. Hey I have a question can you do a article maybe about Tupac? No one knows what happened to him and some believe he’s alive. Would love if you made an article about that:) love your website by the way, very interesting. Thanks!